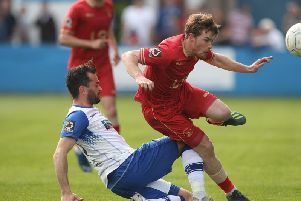 Hartlepool United’s countdown to the League Two campaign will step up another notch this week. Pools will play their final friendlies, at Seaham Red Star and Guisborough Town tomorrow night and at home to Scunthorpe United on Saturday. That will then give boss Craig Hignett a full uninterrupted week on the training round at Maiden Castle to hone his players ahead of Colchester United’s arrival on Saturday, August 6. Just Lewis Hawkins and Brad Walker of his outfield players have, thus far, completed a full 90 minutes in pre-season. But that will change tomorrow when Hignett and first-team coach, Curtis Fleming, will take teams to Seaham Town Park and the King George V ground to play Northern League opposition. Only on Saturday may we get a hint to see what sort of side the Pools boss maybe thinking of sending out against the U’s. For now, the sole concern of Hignett, whose squad drew 0-0 at Livingston on Saturday, is getting every member of his squad ready for a week on Saturday. “I’m mixing and matching at the moment, giving some lads 45, some 60,” Hignett told SportMail. “It’s hard to get any pattern or cohesion when you are doing that, but really now is about getting the minutes in the legs for everyone. Hignett was a little frustrated not to have turned a lot of possession at Livingston into goals. The manager joked that Pools were getting the goalless draws out of the system now before the Football League programme opens but says the sharpness in the box will come. “Overall, I was pleased with what I saw,” said Hignett. “The only disappointing thing was the final third. “We got into some great positions in the final third but then picked out the wrong choice, or were sloppy with our passes. “We need to sharpen up, but this is still pre-season. “We’ll get the 0-0s out the way now, but it’s not easy when you are chopping and changing players, some have had 45, others an hour, some less, some more. On the subject of fitness, Hignett said there are no problems with the three players left at home, Trevor Carson, Rob Jones and Jake Orrell. “There is nothing serious,” said the boss. “I didn’t see a need to risk them, there were enough players to bring. Walker, also missing from the squad, had played the previous night in the 2-0 defeat to Spennymoor at Billingham Town. Pools sent out a young side against the Evo-Stik Premier Division outfit, strengthened by the presence of Walker, Josh Nearney and Connor Smith, with summer signings Ben Pollock and James Martin both playing.